This food processor looks much like the original version that made food processors so popular in home kitchens, but now it’s updated with a new chopping blade and a brushed stainless steel finish. The operation is simple, with a single lever to turn the machine on, and a second lever for off/pulse functions. The bowl holds 14-cups, so it’s large enough for family meals and it has dual feed tubes, so you can feed whole large vegetables in the large tube or stand thin foods like carrots and celery in the inner small tube, so they won’t fall over during slicing. This includes a slicing disc and a shredding disc, so this can do everything you need, without including a lot of extra accessories that you’ll have to find room to store. Need some more help finding what you're looking for? Read through our best food processor​ article. Ninja has made a number of innovative and popular blenders, while keeping prices affordable. This professional-style blender has 1,100 watts of power and three speeds, along with pulse and single serve functions, so you can blend everything efficiently. The 72-ounce pitcher is large enough, with a 64-ounce maximum capacity, to crush ice into snow for a pitcher of frozen margaritas or to make healthy morning smoothies for the whole family in one batch. This also includes two 16-ounce cups with to-go lids so you can make single drinks without dirtying the large container. The pitcher, cups, and lids are BPA free and dishwasher safe, so cleaning is easy. Are you tired of replacing blenders every year or so, when the motors burn out? Add this one to your kitchen arsenal, and it will be the last blender you ever buy. It’s built to last and it can do everything you need, and more, from turning ice into fluffy snow to grinding grains into flour. The blending speed is easy to adjust with a simple dial, and you can change that speed as you blend, so you can always control the speed to get the texture you’re looking for, while the pulse feature lets you do a rough chop for the perfect salsa. The blades spin so fast that you can heat cold ingredients to steaming hot in about six minutes, for smooth hot sauces, salsas or soups. While the food gets hot, the motor is designed to run cool, so it won’t overheat with extended blending time. For frozen treats, the rapid blending means that your ingredients won’t have time to heat up, so you can make soft-serve frozen treats when you start from frozen ingredients. This blender can also knead thick bread doughs, blend smooth batters for everything from pancakes to cookies, and grind nuts into smooth nut butters. Cleaning is just as simple. Just add a drop of dish soap and warm water, and the machine cleans itself in about a minute. If you don’t need fancy functions or a high-powered motor, this blender is a solid machine that will do a great job making milkshakes and smoothies, and it will do a decent job with frozen cocktails as well. It has a 40-ounce glass blender jar, multiple speeds, and high and low pulse functions, so you’ve got a total of 14 options for blending. While it won’t compete with the high-end blenders, it can handle the basic tasks that most people use blenders for. This food processor has all the functions you’ll need, and the power to work with the ingredients you use most. It includes five multi-function discs and three blades that make short work of everything from dough to cheese to salsa. The large 16-cup bowl will handle large batches for the whole family, while the 2 1/2 cup mini bowl is ideal for making hummus for one or blending just a little chimichurri for a garnish. The super-wide feed tube lets you process most vegetables without needing to cut them into small bits, and the LCD screen displays a count-up and count-down auto timer, so you can monitor the processing time. The small feed tube makes it easy to handle small ingredients, while the small pusher doubles as a measuring cup. A silicone seal reduces leakage while the processor is running. The variable slicing blade can be adjusted to 24 different slicing thicknesses, from paper thin to 8mm. The other discs are for julienne cuts, French fries, and whisking, as well as a reversible shredding disc. Blades include a universal chopping blade, a dough blade, and a blade that fits the mini bowl. This includes an accessory storage box to hold the discs and blades to keep them safely tucked away when not in use. If you don’t want to spend a lot on a food processor, but want to keep all the features (and the size), try this model from Hamilton Beach. It doesn’t have quite as many frills and the motor is a bit less powerful, but if you’re only using your food processor occasionally, it will still do a fantastic job. This model has a reversible disk that slices on one side and shreds on the other, along with a separate French fry disk. It also includes a chopping blade, but it doesn’t come with a dough blade. This processor has three speeds, plus a pulse, so it can handle basic chopping, mixing, and shredding, but it might not be powerful enough for kneading stiff doughs. We bought a top-rated food processor that our reviewers tested for six hours. We asked our testers to consider the most important features when using this food processor, from capacity to ease of cleaning. We’ve outlined the key takeaways here so that you, too, know what to look for when shopping. Capacity It’s important to match the jar or bowl to the amount of food you’ll be stuffing into it. If there’s not enough food in the bowl, it won’t blend well. Too much food and you might experience spills or leaks. 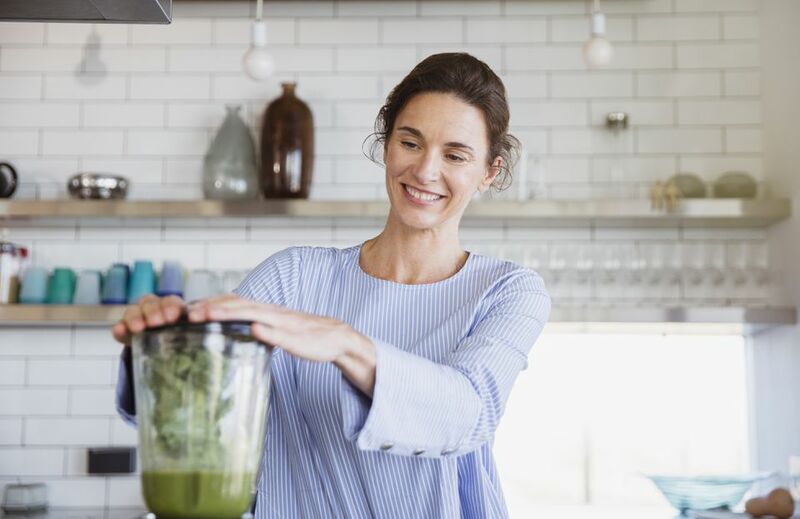 If you’ll be working with both large and small amounts on a regular basis, a blender or processor with multiple-sized containers might be the best buy. Controls Do you prefer knobs, buttons, toggles, dials, or touch screens? Today’s appliances offer a wide variety of control methods. Simple units might only have an on/off toggle, while others might have variable speed control or a variety of buttons. They’ll all get the job done, so it’s all about personal preference. Cleaning Both food processors and blenders have sharp blades, which can make cleaning just a little bit hazardous. Do you prefer hand washing or do you feel safer placing the parts in the dishwasher? Do you prefer a removable blade or a fixed one? If you don’t like cleaning the appliance, chances are you’ll avoid using it regularly. This food processor came highly recommended by our testers, particularly for large volumes of food. “It's great for finely chopping herbs and vegetables, shredding and grating cheese, and slicing meats and veggies,” revealed one of our reviewers. Our testers also liked the “intuitive design,” easy cleanup, and comprehensive instructions. “All three blades worked well, as long as you're using them for their intended purpose (and the instructions that accompanied the food processor do a great job of explaining which blades should be used for which foods),” explained one of our reviewers. While one of our testers noted “it’s a great size if you're regularly making large batches of food,” he cautioned that, for basic food prep, this processor may not be worth the purchase because it's so bulky.